1 Arduino (Any model works). 1 submersible pump. Used in aquariums and small fountains. I'm using one that provides 160 liters-per-hour. 1 relay module. There are many models out there. There's no big secret on selecting the components. The relay shall support the Voltage at your home, and shall also support the current requested by the pump, which is usually low. I'm using a 10A/240V relay, while my pump takes less that 4W. Replicate the above wiring and fix the ultrasonic sensor at the ice-cream box using hot glue or epoxi. Fill the box with wather, place the pump inside the water and close the box. Make some holes at the lid, so the pump hose can pass through it, and the expeled water can return to the box. Then just plug the power and use your hand to activate the sensor. It shall start the water flow when you're at least 30 cm from the box. 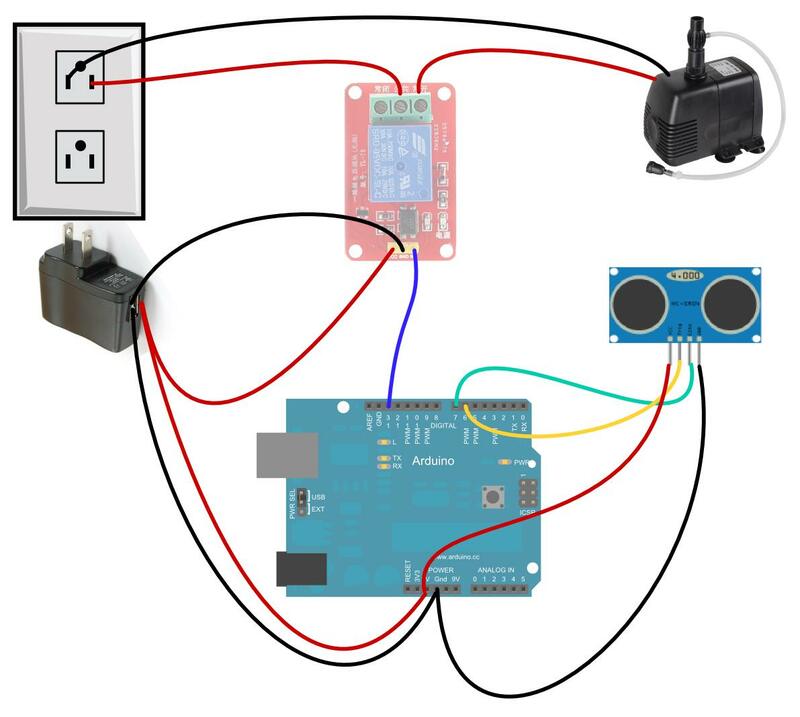 By default, the Arduino will poll the sensor activity at each 2 seconds, and will keep the water flow for 1 minute after returning to wait mode. These numbers are easily changed at the code. Not it's time to train your cat. 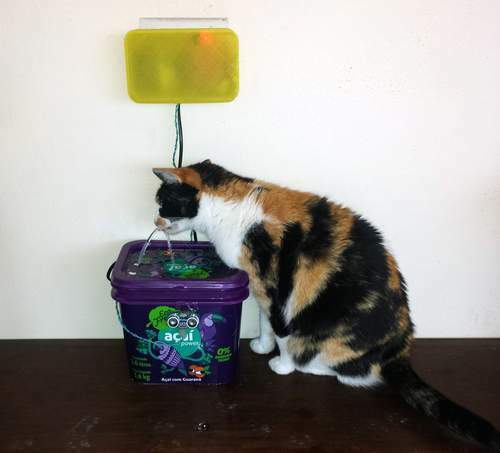 It helps putting it on a position that the sensor will activate as the cat passes through. My cats were a little distrustfull and shy at first, as it is expected with any cat experimenting new things. But, after just a few moments alone with the new fountain, they started drinking and never asked for the faucet again.